Cole McCleary (Glenn) is a tough, racist, hard-drinkin’, hard-fightin’ and hard-swearin’ Texas Deputy Marshal. Naturally, his superiors and colleagues don’t approve of his rogue ways. They seem to be oblivious to the fact that he always gets results. When super-evil bad guy Torres (Castellanos) and his “weak link” partner T-Boy (Cruz) do some REALLY bad stuff and abscond to Miami, Cole follows them. Now a complete fish out of water, this throwback of a Texas lawman must contend with a multi-racial environment and a lot of bright colors and upbeat people. He’s NOT happy about this. His new partner is Jamie (Batinkoff), a young, hip dude who Cole doesn’t really take a shine to. It turns out the criminal mastermind behind all the murder, drugs, kidnappings and probably a lot of other things is DeClerc (Forsythe). Cole must take down the evil empire in his own way - as well as get involved with Rosa (Marie) in a romantic relationship, showing he may have a soft spot after all. Scott Glenn is simply awesome in his role as Cole. He’s completely believable as the old-school Texas badass who hates everyone in equal measure. He’s grizzled and plays by his own rules. You should watch this movie for his performance alone. Sure, towards the middle of the film there’s some unnecessary justifications/psychological explanations for his ways, but you kind of HAVE to do that, and it doesn’t take long. One of the more interesting aspects of The Last Marshal is how true it is to its title - Cole truly is the last of a dying breed, and a man out of time. The movie should have explored this aspect just a little bit more - how no-nonsense enforcers like Cole are slowly being replaced by pretty boys who are just prissy and ineffectual. Speaking of the title, it is misspelled in the film. Director Kirton (also responsible for the Forsythe vehicle Strike Force 2003, and who has an extensive stunt background) finds some good locales - from the Texas-set opening of the film, to the Miami “Steak n’ Strip”, a combination steakhouse and strip joint, one of the most macho eateries we’ve yet seen on film. Kirton scores big points for releasing such a politically incorrect (for the most part) film in 1999. In fact, except for the music, this movie could have been made in the 80’s. We can’t forget William Forsythe with his “German” accent and his sidekick Sunny (Boyle). He and his goons certainly raise a high bar for pure evilness. But Cole only wants the goons. He’s not interested in solving every single problem in life. Just the ones that came to his Texas turf and ruined his day. 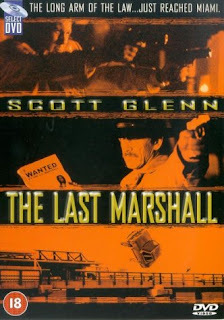 The Last Marshal has DTV violence and fun cliches in equal measure. Just check out the classic-of-all-classic Black yelling police chief Lukowski (Wilcox). What the world needs now, more than ever before, is Cole McCleary. Yeah this was pretty good, it's a shame Scott Glen isn't more well known, the lovely Constance Marie(who's mostly known for the sitcom George Lopez) also deserves a mention. Happy you enjoyed it too! 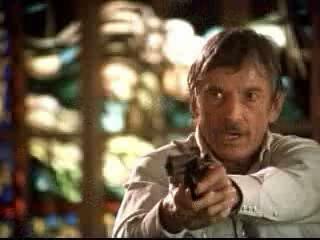 Scott Glenn has made some solid action flicks. Pretty sure that what it says on Scott Glen's business card. I want to check this one out. My only real time with Glen is the awesomeness of Backdraft. M. Brown: We know you will love it! It's Glenn at his absolute best. Harry: We are happy you love it too. Scott Glenn is perfect as Cole McCleary. Always wanted to see The Challenge. Will have to check that out. Yup, once again, you've reviewed another favourite movie of mine. I crack up laughing at the profanity in this movie. This should have had a sequel, I can pretty much watch Scott Glenn in anything. BTW, I don't know if you're aware that the fight co-coordinator on 'The Challenge' was none other than Seagal himself? I've been looking for this film for awhile, but haven't had any luck finding much of anything, maybe you'll have better luck finding it then I have. Lee: Did not know that about Seagal. Will have to check out The Challenge. Happy you enjoyed the ridiculously fun profanity in The Last Marshal too! Haha. Totally agree about the sequel. Scott Glenn was born for this role. Venom: Sounds good! Will love to see it...will have to look around. Looking forward to your take on Timebomb!